We’re currently in frigid Manitoba, central Canada, where we are soon to start the printing of LABYRINTH SUBLIME: THE INSIDE PASSAGE. We’re in Altona, a Mennonite community, working with Friesens Corporation, an employee-owned printing company. Yesterday we had one last look at all the digital files for the images and pages with Ray Friesen. Together, on the computer, we tweaked a few shiny, wet rocks, the sun-lit front of a glacier and the bright white heads of a couple bald eagles to bring out existing detail in these highlights. The updated Registry of Subscribers, finalized with 36 Collectors, was positioned on its page with the image entitled Orcas and Kayaker. Having completed many checks, we gave approval for all pages to progress from pre-press to plate-making. 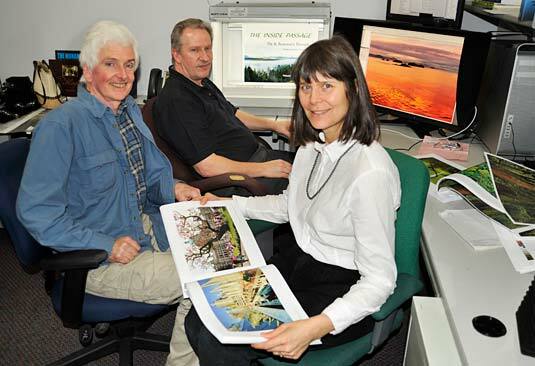 Here’s a photo of Pat, Ray, and Rosemarie working together in pre-press. Rosemarie holds a scaled-down, blue-print version of the new book used for proofing layouts and collation. As we write to you, the first set of laser-etched printing plates are being burned for installation on a Man Rolland 900, a state-of-the-art, computer-controlled, 50" press. Loaded into the wells of this locomotive-sized press are Arrowstar Light Fast inks manufactured by the Flint Group. Tests for flow, density and so on of these specialized inks are being run by the pressmen right now. Our Sterling Ultra-Gloss paper, heavy at 100-pound, cover weight, has been climatizing in the plant since its arrival earlier this month. With paper being hydroscopic, a standard humidity level is maintained from the mill in Wisconsin to the printing plant where we are today. During transportation the paper was sealed in heavy-duty plastic within a closed truck to ensure moisture stability. The NewPage Corporation had custom-manufactured this paper with the grain orientation we specified. The added expense and time is necessary so that once the pages are bound, the paper grain will run parallel to the book spine, allowing pages to roll and open comfortably — an important consideration given the thickness of our paper. Correct paper grain also allows for the safe adjustment of the book to the humidity conditions in the Collector’s home, where ever in the world that may be. While the book adjusts to the local humidity, sometimes pages temporarily cockle before stabilizing perfectly flat. Orienting the paper grain correctly ensures that there is no humidity-induced expansion or contraction of the paper along the spine, thus completely avoiding any stresses to the binding. In a few hours the pressmen will be ready for us to work with them on getting the colours exactly right on the first four pages. We are here to give direction for the entire press run, however long this takes. At minus 35°C plus a significant windchill, it is cold here in southern Manitoba! The dry snow squeaks under foot and tires. Indeed, the drifting snow over the prairie landscape is quite reminiscent of our experiences on The Ice, the polar plateau of Antarctica. At least we’re not camping out this time! Earlier this week when we first arrived in Manitoba, we took these photos including an amazing sundog, the finest we’ve ever seen anywhere! 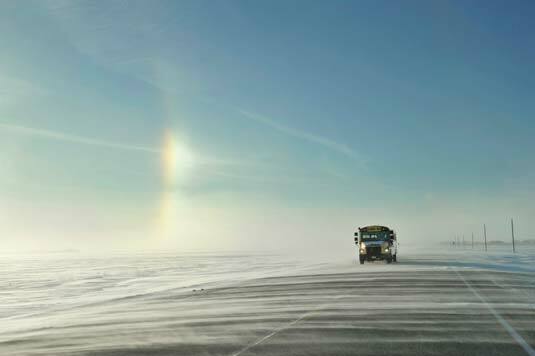 The mirrored colour bands, positioned equal distance from either side of the sun, are an atmospheric phenomena caused by suspended ice crystals. 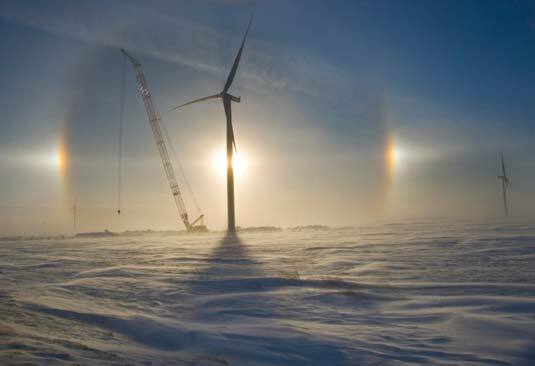 What you’ll see in the photo with the windmills is not a lens flare, rather this is the sundog exactly as we saw it during our drive from Winnipeg to Altona across the flat prairie. 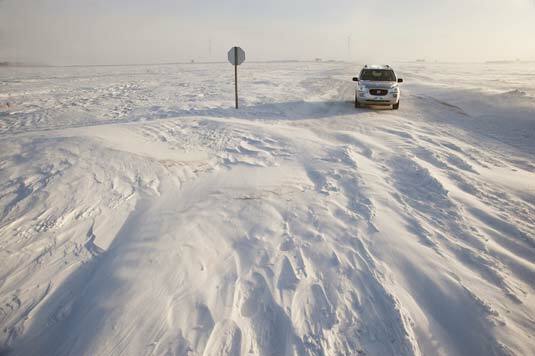 The driving conditions are interesting with fingers of snow flowing constantly across the elevated highway, and sizeable drifts making side-roads all but impassible. We include a picture of a school bus coming toward us. We learned that when temperatures with windchill fall to 45° below, school is cancelled as a precaution. School buses have no insulation. A stranded bus full of youngsters on a lonely, freezing, wind-blown stretch of highway is a risk not worth taking. More reports to follow over the days to come during the long-awaited printing of LABYRINTH SUBLIME.